The traditional short-rib-and-ale pie at The James. Their venture, The James, opened Feb. 1. in Needham. The modern Irish pub “is still quaint and cozy, but there is now an amazing food culture in Ireland, with excellent chefs and menus. We definitely wanted to bring that into the Boston fray,” Henry said. The two co-owners turned to chef Alex Horowitz, previously of Wellesley’s (now-closed) Blue Ginger, who they knew from their bartending days. “We had the same vision of elevated comfort foods but a little different and more exotic than people were used to — we didn’t want to play it safe,” Henry said. THE LOCALE Henry and Dowling looked at more than a dozen potential spots for their pub the past couple of years. Then they heard about the location tucked just off Great Plain Avenue in Needham. “As we walked around the corner, the train was pulling in right out front, which grabbed our attention. We fell in love right away,” Henry said. The space, an old train station lined with granite, is “old-timey” and “kind of amazing — it reminds us of places back home,” Dowling said. There are 67 seats, including the bar toward the front that fills with young professionals as the evening goes on. Families are encouraged; according to the website, “Men, women, children and muddy boots welcome!” We certainly experienced that family-friendly hospitality during our weekend visit. ON THE MENU The James features a range of smaller plates intended for sharing. For some traditional Irish fare, start out with the fresh-baked soda bread slathered with honeyed Irish butter ($5), or the spicy lamb sausage Scotch egg ($14), its yolk still runny when halved, accented by black garlic aioli and pickled mustard seeds. More unexpected and too tantalizing to turn down is the gorgeous grilled octopus ($15). The smoky tentacles emerge from a lemon-infused chickpea puree whipped with za’atar, drizzled with roasted garlic oil, and scattered with crispy chickpeas. The James’s larger dishes include a range of pub classics. 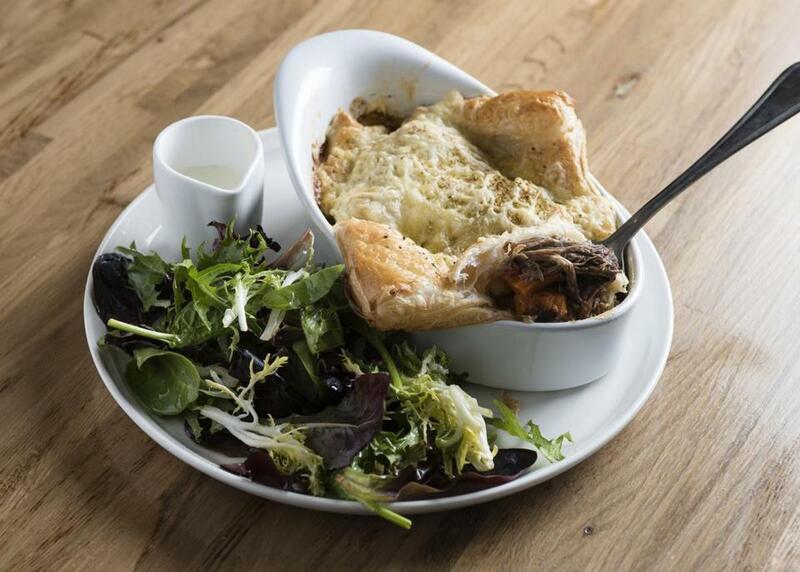 The traditional short-rib-and-ale pie ($20), a Gruyère puff pastry with a horseradish-infused mascarpone, is Irish comfort food to the core. Pub mussels ($16) are rich, aromatic and pleasantly spicy, owing to garlic, shallots, chili and a Belgian-ale-and-butter sauce. Irish cheddar, mayonnaise, bib lettuce, and grilled onions are layered upon the burger ($16), which comes with fresh-cut fries. And less traditional is the Korean rice cakes ($22) arrayed with summer greens, cauliflower, shallots and garlic, all bathed in sesame-soy sauce. Like any good pub, there’s a solid beer list, focusing on craft New England selections in addition to a certain well-loved stout from Ireland. Eight lines are rotated each month alongside 25 beers in bottles and cans. The cocktail list includes the “Go On, Go On, Go On,” a tea-infused Irish whiskey with lemon, honey, and bitters; and a gin and tonic with Irish gin, elderflower tonic, cucumber, juniper, and citrus. The James was initially only open for dinner but just started serving Sunday brunch, with Saturdays to follow. Sláinte! The James, 1027 Great Plain Ave., Needham, 781-455-8800, www.thejamespub.com.